Connoisseurs of the meat dish with a dairy name have elevated what was once a butcher's way to sell undesirable bits and pieces of the hog into a carnivorous foodie's go-to charcuterie offering. 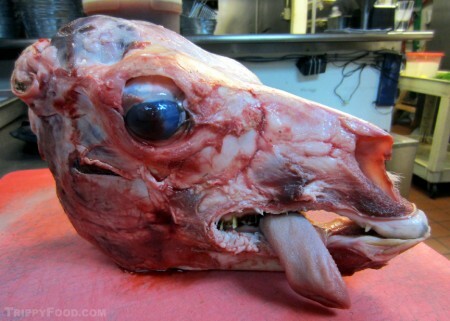 Head cheese incorporates the fleshy parts of the pig's head into a gelatin suspension created from collagen in the bones as the head is cooked down. Many chefs famous for their charcuterie will feature a house-made head cheese on their carving boards, although for those who have access to the heads and a few days on their hands, making head cheese is something even a home cook can create with relative success. 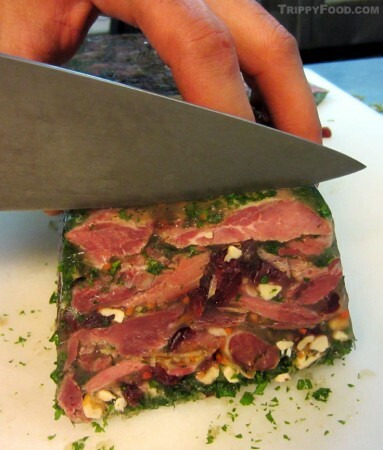 Since on a basic level, head cheese is made from an edible animal's head, one can forego the dish's porcine requirement and substitute to their heart's delight; just keep in mind that it's not quite as simple as boiling a head and then pouring the resulting soup into a terrine. 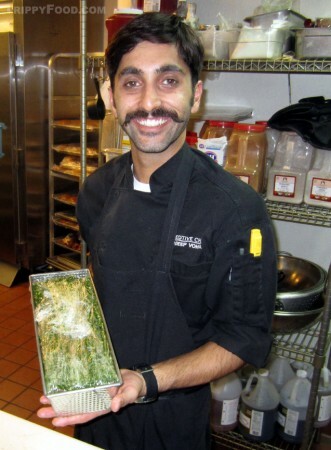 To make your Noah's ark head cheese product a success, we have created a video featuring Executive Chef Sundeep "Sunny" Vohra of Kings Row Gastropub creating head cheese using alpaca heads provided by Exotic Meat Market. Although the audio quality is inconsistent, you can follow Chef Vohra's instruction using the recipe provided below. Whether you choose to replicate Sunny's alpaca head cheese, or an animal of your own choosing, there's no better way to embrace the nose-to-tail philosophy in ensuring that no part of the beast goes to waste. Happy head hunting, and please let us know how it works out (unless you can convince Chef Vohra to add the alpaca head cheese to his menu)! This entry was posted in Southern California and tagged alpaca, Anshu Pathak, brine, CA, California, charcuterie, chef, collagen, Exotic Meat Market, gastropub, gelatin, head, head cheese, hog, Kings Row, Pasadena, pig, Sundeep, Sunny, Vohra. Bookmark the permalink.